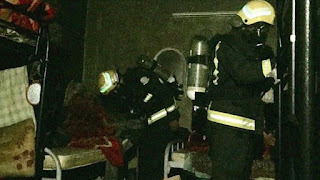 Eleven migrant workers died from asphyxiation when fire swept though a windowless house they shared in Saudi Arabia, officials said. Six others were injured in the fire in the south-western city of Najran, the civil defence directorate said. The victims all hailed from Bangladesh and India, it added. The region's governor has ordered an investigation and expressed concern over workers' accommodation, the Saudi Press Agency reported. An estimated nine million foreigners work in Saudi Arabia, many of them from South Asia. Rights groups complain that foreign workers often suffer poor conditions and are unable to switch jobs or leave the country without the permission of their employers. "Firefighters put out a blaze in an old house where there is no ventilation (windows) resulting in the death of 11 residents and injuring six others due to smoke inhalation," the civil defence directorate said in a tweet. Najran Governor Prince Juluwe bin Abdulaziz bin Musaed ordered an investigation into the deaths after reading a civil defence report, the Saudi Press Agency reports. It said the governor had "expressed disappointment" about the lack of control of foreign workers' lodgings in the region.